Second Foundation is divided into two parts, one dealing with The Mule’s search for the second foundation, and the other with the First Foundation doing the same, although later chronologically. The book also with interludes of a dialogue between two second foundationers, which I found quite interesting. The Mule was a big twist for me. I first suspected “Magnifico Giganticus” of being The Mule, thinking his name in direct opposition to his physical self, as well as his description of The Mule (a strong, massive type man) was a dead give away. But I ruled that out as ‘too obvious’, wondering why he’d choose to stay so close to the action, and how he could control his growing semi-empire from such a distance. But none the less, Magnifico was in fact The Mule, keeping himself close to infiltrate the higher echelons of power and play his Holophoner look-alike (a Futurama hilarious joke I now get) and alter their minds. And as so many ‘villains‘ before him his downfall was that soft place in his heart for a lovely lady, Bayta Darell. The second half involved the suspicions of the First Foundationers, that the Second Foundation had not been destroyed by The Mule. A semi-secret underground movement is brought about to learn the truth. Arkady Darell and her father Toran eventually get to what they understand to be the bottom of the matter. This section of the book has so many twists and turns I couldn’t possibly cover them all fully. But the location of the Second Foundation, is definitely the biggie. Having only Seldon’s word that it even exists, and that it’s located at “the other end of the galaxy” leads several parties to various conclusions. The explanations of which were extremely satisfying. 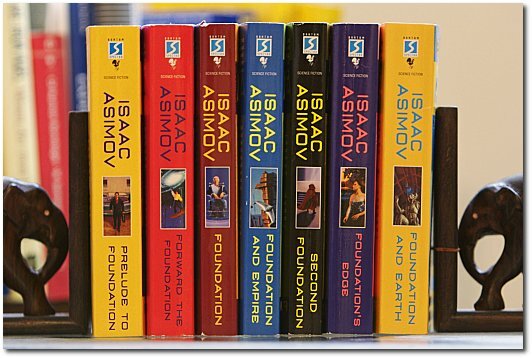 Asimov showed the characters going through various lines of logic and reason, all seemingly profound and obviously true, but each with the Second Foundation being located somewhere else. They piled on top of each other in a way that had the reader believing that each successive answer must be the true one. And to top it off the First Foundationers had a scanning device that could detect tampering of minds, giving what appeared to be a solid test for the theories to be put to. I found the finale dialogue, between the same Second Foundationers, revealing a reality different than each of the previous theorie, also quite satisfying. It made the most sense of all theories previously proposed and answered several questions that each had brought up. But what was most interesting was that the reader is left with a satisfied feeling of ‘now I know the truth’, which is exactly how the First Foundationers feel, when in fact they’re being guided by the Second Foundation. Which prompts one to suspect that perhaps even the reader is being led astray. This isn’t typically Asimov’s style, so it would shock me if it were so, but I suspect his intention wasn’t to mislead the reader, so much as it was to give the reader the suspicion that perhaps they’ve still not uncovered the whole truth. This was a much more action oriented book than the any previous book in the series, and held my attention continuously. As always the dialogue is intelligent and thought out, if a little straight forward. After reading I found myself marveling at the way Asimov must have written, rewritten, worked, and reworked the plot to make it so intricate; to make the solutions so obvious once one has them, but completely hidden when first presented. Onto the next!